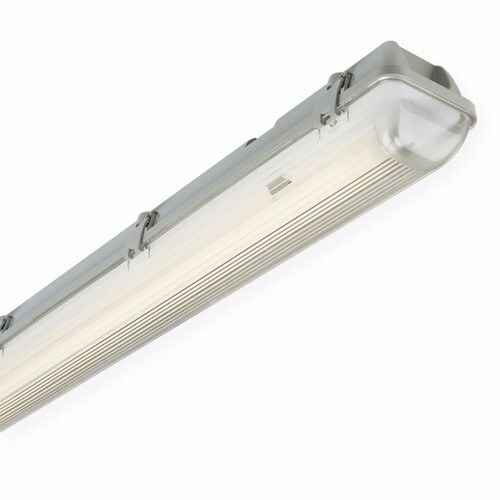 The TR65118HF IP65 230V high frequency waterproof & weatherproof fluorescent fitting from Knightsbridge is ideal for use indoor and outdoor such as warehouses, cattle sheds, barns, or hallways. Houses a 18W 2ft T8 lamp (not supplied with fitting), and is simple to install, with built-in Bracket for wall/ceiling mounting and 6 fixing clips for the diffuser supplied. Electrical termination via 10Amp connector block. Pack Includes: Polycarbonate clips. Fixing brackets 20mm compression gland. To complete installation of this product you may require a T8 600mm 18W Bulb. Eterna White 28W 2D Circular Fluorescent Slim Profile Low Energy Fitting.